Finally! 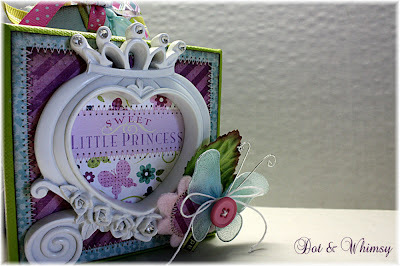 After two days of blogger being down, I'm able to post my newest creation for Dot & Whimsy :) I picked up a package of these cute resin picture frames at Hobby Lobby awhile back. I knew when I saw them that they'd make sweet accents for album fronts and collage projects! This is an accordion scrapbook album that's filled to the brim with princess-ness. I'm in L-O-V-E with the new Lime Twist line from My Mind's Eye...probably my favorite scrapbook company of all time...they consistently put out the greatest product and you don't have to search the entire internet to find it. Today I'm working on an adorable party set featuring honeycomb cupcake toppers, pinwheels and a party-hat cake topper ♥ Then after that, I'm going to tackle a couple of scrapbook layouts...I'm seriously contemplating trying out for Elle's Design Team call for July-December 2011 :) It's been a very long time since I've entertained the idea, but I'm feeling up to the challenge, plus their stuff is so darn cute! So, back to the craft table, lemon-berry slush and Glenn Miller radio on Pandora :) It's been a SUPER SATURDAY...hope you're having one too!